International business is the cornerstone of a globalized business world. Students with training in international business practices and experience are able to work successfully in companies that engage in international trade. The opportunity to get that experience is available through the School of Business Diploma in Business Administration (Global Studies) which is offered in partnership with post-secondary institutions worldwide. 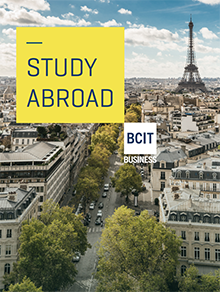 BCIT has already established international student exchange agreements with 18 institutions in 13 countries across Europe and in Korea. This diploma provides a formal framework and a credential for students completing their business studies at our exchange partner schools. Complete a minimum of 9.0 credits* of discipline specialized courses to ensure you are prepared for study abroad. Courses may be additional business courses in a relevant topic or non-business courses relevant to the exchange. Courses may be taken at BCIT or at other BC post secondary institutions. Courses must be approved in advance by the School of Business International Programs Coordinator.